ISRO’s Polar Satellite Launch Vehicle, PSLV-C26, successfully launched IRNSS-1C, the third satellite in the Indian Regional Navigation Satellite System (IRNSS), from Satish Dhawan Space Center last Thursday (October 16, 2014 local time). IRNSS-1C is the third of the seven satellites constituting the IRNSS space segment. 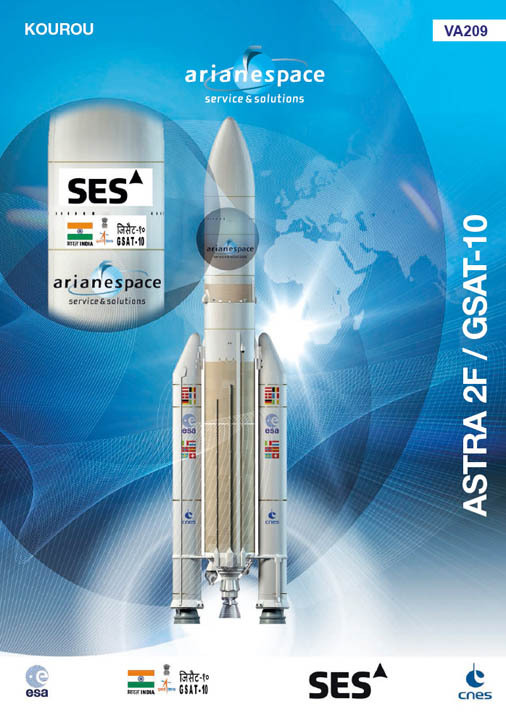 IRNSS-1A and IRNSS-1B, the first two satellites of the constellation, were successfully launched by PSLV on July 02, 2013, and April 04, 2014, respectively. Both IRNSS-1A and 1B are functioning satisfactorily from their designated geosynchronous orbital positions. IRNSS is an independent regional navigation satellite system designed to provide position information in the Indian region and 1,500 kilometers around the Indian mainland. IRNSS would provide two types of services, namely, Standard Positioning Services (SPS) — provided to all users — and Restricted Services (RS), provided to authorized users. After the lift-off key flight events — such as stage and strap-on ignitions, heat-shield separation, stage and strap-on separations and satellite injection — took place as planned. After a flight of about 20 minutes 18 seconds, IRNSS-1C Satellite, weighing 1425 kilograms, was injected into an elliptical orbit at an altitude ranging from 282.56 kilometers (perigee) to 20,670 kilometers (apogee) which is very close to the intended orbit, according to ISRO. After injection, the solar panels of IRNSS-1C were deployed automatically. ISRO’s Master Control Facility (at Hassan, Karnataka) assumed the control of the satellite. Four orbit maneuvers will bring the satellite into its geostationary orbit at 83 degrees East longitude. Earlier this year, ISRO released a signal-in-space interface control document (ICD) for the IRNSS standard positioning service.